StrengthLab Personal Training in Ahwatukee 480-612-7726! This is a current University Text Book used Nationwide! 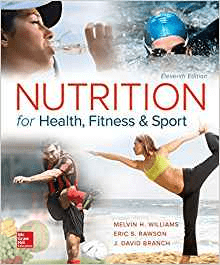 Nutrition for Health, Fitness & Sport, now in its Eleventh edition, provides the reader with thorough coverage of the role nutrition plays in enhancing one’s health, fitness, and sport performance. Current research and practical activities are incorporated throughout. This edition welcomes the addition of author, J. David Branch, along with the return of author Eric S. Rawson from the tenth edition, both of whom are actively involved in the disciplines of exercise physiology and sports nutrition, and who have used this textbook over the years to teach their university classes. The eleventh edition truly moves into blending the latest technology for individuals to utilize in combining nutritional and exercise choices for health and sports performance. Featured nutritional information includes the introduction to the Academy of Nutrition and Dietetics position stand on the total approach to healthy eating and to the latest report on Dietary Guidelines for Americans, while exercise and physical activity featured content includes the introduction to High Intensity Interval Training (HITT) and its possible application to exercise for health, along with the Compendium of Physical Activities. Enhanced discussion of the latest trends of various exercise applications (apps) and personal digital fitness measurement equipment, such as fitness bands and fitness watches, are also hallmarks of the eleventh edition. More than 300 new references, including clinical studies, reviews, and meta-analyses, have also been added to the text. Look for the Positive, Not for the Negative! Positive Psychology, Not Standard Psychology! Feed My Starving Children! Thanks for Volunteering! Enjoying a Mountain Bike Ride in Pine, AZ! Epic Rides Carson City Mountain Bike Race (Sierra Nevada Mountains)! Clean WordPress Themes | Dubai Apartments Ahwatukee StrengthLab Personal Training 480-612-7726 Copyright © 2019.